Why Are Players Wearing Camouflage Jerseys? 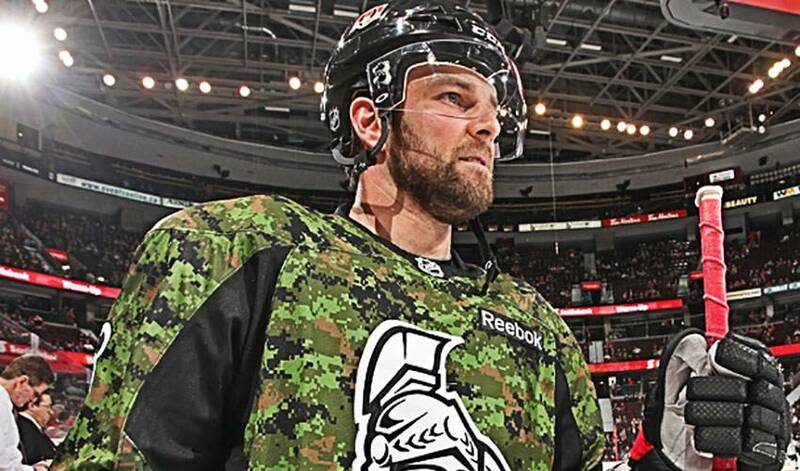 Players have been sporting custom camouflage jerseys during warm-ups this week to pay tribute to the Armed Forces in the US and Canada. If you’ve been watching hockey highlights this week, you may have noticed many players wearing some unusual jerseys during pre-game skates – custom-designed camouflage jerseys. This is part of a league wide effort to show support for US and Canadian Armed Forces, while raising money for team charities that work to benefit military families. This past week, players of the Ottawa Senators, Colorado Avalanche, and Minnesota Wild all wore camo jerseys during their warm-ups and signed them before their respective games. The signed jerseys were then featured in auctions (at the game or online) with proceeds raised from the auctions going to local military focused charities. Players are proud to be involved in saluting our service men and women across the league. In fact, many teams host military appreciation nights multiple times per season. Even Ottawa Senators left winger Mike Hoffman’s dog got into the spirit this week. To bid on the remaining, pre-game worn signed camo jerseys, go to auction.nhl.com.